Feature Events on Your Home Page! 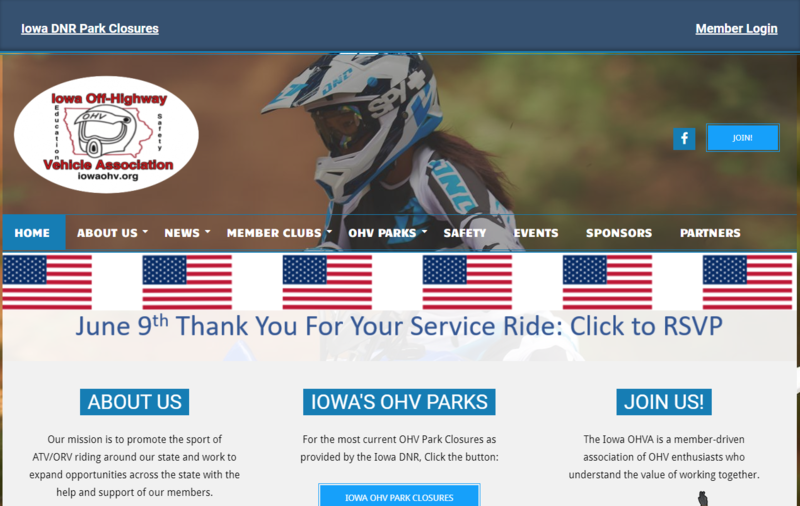 The Iowa OHV Association approached RideTrails about how to feature their upcoming “Thank You for Your Service Ride” on the Home Page. To assist them, we created a “Banner Ad” for the event that links to the event and event registration on their site. This Banner utilizes the “Slider” Capability that every RideTrails.Org site has and can be used even if you have a rotating slider enabled. Create the banner image on your computer. We recommend that the banner be sized approximately 1300px by 200px. Create the slider using just one image (so it will not actually ‘slide’). Be sure to give it a title, add a “Slide Link” to link the image to your event, and save it! Go to your website home page (while logged in) and select “Customize” from the top menu. That’s it! Now you should have a banner on your home page that links to your event! When your event is over, you can just delete the slider and it will go away. Need help with this? Contact us and we will be happy to help you out! Previous Post: Upgrade Your Events Game with Events Manager Pro! Next Post: Introducing the RideTrails.Org Affiliate Mall!